I know I said I'll post later on today but what can I say....I'm seriously addicted here!!!! This is my card for the Sketch Challenge over on SCS. What do you think? Are you feeling it?? I am because it's a great way to use up those scraps of DSP you have laying around!! Nothing wrong with being a *thrifty* crafter, I personally think it makes DH love me more since I'm constantly *re-using* things from around the house LOL!! Anywhoo, my creation is using the Bella Rose DSP and my fave color combo of Pink & Brown...Pink Pirouette & Chocolate Chip to be exact. When I was putting this cutey together, I noticed that it needed something extra so I added the strip of Chocolate Chip Taffeta Ribbon, a few halfback pearls and the paper piercing in the corners. Voila, I believe this baby is done!!! Thanks so much for stopping by and I hope you have a great rest of the day! 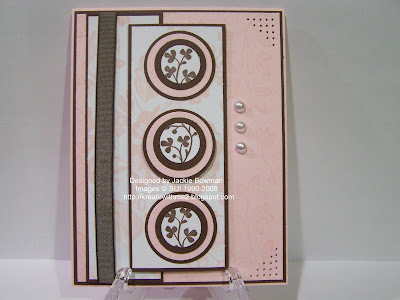 Jackie, love the pink and brown colors and like the layout, too! This is gorgeous! The color combo is the best! great work!! that is a very fun card...your color combo and layer choices are very nice! I like the pierced corners too!!! I love your cards. This one is so soft, colour combination is wonderful. Very nice job. Your blog is gorgeous, I'm so glad I found it!! You know how much I love your cards, always so beautifully done! Great card, Jackie! I love the colors and the pearls! Perfect!! Great job with the colors and the sketch today...I know what you mean about posting...I am addicted too! Come visit me...you're one of the blogs I check daily! Thanks for stopping by my blog. I love your work. I adore that card. Love the colors! One of my favorite color combos!! Love the card, and layout. The half pearls add such a pretty touch. I love the colors and the pearls!! Great job....tfs!